devastating effect of lightening, electrical short circuits, leakage currents & the after effects. to electrical apparatus, junction boxes, power or control panels, machineries or equipments. 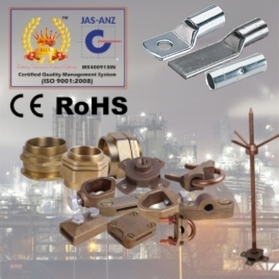 Leading manufacturer of cable lugs, cable glands, earthing and lightning protection accessories based in Ahmedabad, India. Quality is defined as the measure of excellence. At EXAR Industries, our motto is to aspire for the excellence. Every activity is to attain the objective whether in product quality, customer service, product offering or innovation. Core values of Exar Industries are influenced by our past, tempered by our present and are designed to shape our future. They are an amalgam of what we have been, what we are and what we want to be. Cable lugs are Electrical Accessories used for securely connecting or terminating power cables to electrical apparatus, junction boxes, power or control panels, machineries or equipments. Cable glands are Electrical Accessories used for fixing power, control and instrumentation cables to electrical apparatus, junction boxes, power or control panels, machineries or equipments. Exar Industries is a leading manufacturer of cable lugs, cable glands, earthing and lightning protection accessories based in Ahmedabad, Gujarat, India. Founded by first generation entrepreneurs, the corporate leadership of the company is young and poised to lead the company to greater heights. Exar is backed by technocrats with in-depth knowledge and years of experience in the electrical industry. We are backed by state of the art infrastructure with a dedicated and diligent work force. At Exar, we follow modern and best production processes to achieve optimal result. Our wide distribution network of suppliers and distributors ensures prompt, safe and smooth delivery of the product to the customers.